Well, that's not entirely true. We did have the announcement last week that Michael Arndt was moving on from his work on Star Wars and J.J. Abrams and OT scribe Lawrence Kasdan would do the heavy lifting the rest of the journey. Now comes an interesting rumor about a certain space smuggler. Jedi News is reporting that the deal to have Han Solo in the Sequel Trilogy has been finalized. And by that, it would include more than just "Episode VII". 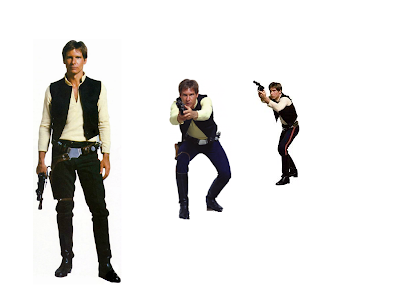 So the stuck-up, half-witted, scruffy-looking nerf-herder could wind up being seen in the entire trilogy. At least he'll be seen in "EpisodeVII" and "Episode VIII" if the rumors are to be believed. From the Bothans I've talked to say that Ford was looking for finality to his character. The resolution the actor wanted in "Return of the Jedi" appears to have been the price for his signing on. Those of you that don't know what I'm talking about can simply Google it. That said, I would have thought it only requires one film. I guess they want to stretch the character out over a longer period. Could this be the reason for Abrams and Kasdan's taking control of the current/final drafts? It was also noted that the actor wanted a guarantee of "Indiana Jones and the Quest for the Platinum Wheelchair". The article says he didn't achieve that. This doesn't mean I'm against another Man in Hat film, it just means after the last adventure I'm a little worried about seeing an aging archeologists and his unconvincing spawn of a Mutt. How about a prequel to Crystal Skull so as to not have to deal with that? Abrams brought back Leonardo Nemoy for his Star Trek reboot as a way to legitimize the new movies, problem with playing the same trick with Star Wars is that Han/Leia/Luke are pivotal in the Star Wars novels post Return of the Jedi . . . and they don't look like grandparents. Wish Abrams had recast younger actors/actresses. The Zahn triology of books should be made into movies. The unthinkable might happen a Star Wars trilogy that is a failure, story should trump cameos! I couldn't disagree more. The Zahn novels, while serviceable, felt contrived and disconnected. Worse than that, they do not feel like Star Wars stories. He failed to capture the nuances of most of the characters from the first trilogy as well as the story flow. Everybody wants Star Wars like the Star Wars they got 30+ years ago. What they are doing now with Kasdan, Ford, Lucas and Kennedy is the best bet to achieve it. I have to agree with the previous commenter - both that the story should trump cameos and that they should make the Zhan books into movies. Hopefully the 'original actors' actually are just cameos and not the focus of these next movies. I loved those characters, but if the studio wants to continue the franchise, they'll have to go beyond them. Timothy Zahn is pretty much the dean of the Star Wars novels universe. His trilogy of books post Return of the Jedi basically setup the post Jedi world. You've got a partially crumbled but still powerful Empire, the new government on Coruscant, and Luke's love interest, Mara Jade, and the Solos starting their family. Plus as a villain, Grand Admiral Thrawn who manipulate a cloned Jedi master. Zahn's stuff is space opera. I'm kinda concerned that Abrams and co are going to write this new trilogy, it would be as if they didn't use the books for Lord of the Rings, but decided to make up their own story. Hard to do in a limited amount of time. The novels are still mostly about the big three Luke Skywalker, Han Solo, and Leia. I don't want to see a hand-off to the Solo twins, I'd rather they hire new actors. Sure Harrison Ford is a good actor, but somebody else could play Han well, same thing for Luke/Leia.